Kalen Wayne Peters, 21, of Livingston, allegedly provided Caleb Edwards with beer and the vehicle that killed 2 people on December 8, 2012. Wheels of Justice Turn, Second Man Indicted in December 2012 Dual Fatal Accident, LIVINGSTON, June 3, 2013 - On May 27, 2013, a Polk County Grand Jury indicted a second man in the December 8, 2012 accident that took the lives to of a brother and sister on US-146. 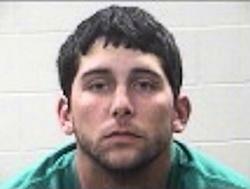 Kalen Wayne Peters, 21, of Livingston has been charged with and indicted for manslaughter and tampering with a witness. Peters allegedly provided the underage Caleb Edwards (18 at the time of the accident) with beer and the vehicle that slammed into a Chevy S10 pickup that was south-bound on US-146 that terrible evening. The accident killed 17 year old Jacob Gerrit Klein of Goodrich and his older sister, Tiffany Ranee Semons-Lewandowski, 33, also of Goodrich. The indictment proceeding was held in Judge Elizabeth Coker's 258th District Court.